Website: means the PrintCarrier.com GmbH website available at www.PrinCcarrier.com. 2.1 Subject to any variation under condition the Contract shall be on these conditions to the exclusion of all other terms and conditions (including any terms or conditions which the Buyer purports to apply under any purchase order, confirmation of order, specification or other document). 2.3 These terms and conditions apply to all PrintCarrier.com GmbH sales and any variation to these terms and conditions and any representations about the Goods shall have no effect unless expressly agreed in writing and signed by a managing director of PrintCarrier.com GmbH . The Buyer acknowledges that it has not relied on any statement, promise or representation made or given by or on behalf of PrintCarrier.com GmbH which is not set out in the Contract. Nothing in this condition shall exclude or limit PrintCarrier.com GmbH liability for fraudulent misrepresentation. 2.4 Each Order or acceptance of a quotation for Goods by the Buyer from PrintCarrier.com GmbH shall be deemed to be an offer by the Buyer to buy Goods subject to these conditions. 2.5 No Order placed by the Buyer shall be deemed to be accepted by PrintCarrier.com GmbH until an Order Confirmation is issued by PrintCarrier.com GmbH or (if earlier) PrintCarrier.com GmbH delivers the Goods to the Buyer. 2.7 Any quotation is given on the basis that no Contract shall come into existence until PrintCarrier.com GmbH confirms the Order through the Order Confirmation to the Buyer. Any quotation is valid for a period of 7 days only from its date, provided that PrintCarrier.com GmbH has not previously withdrawn it. 2.8 PrintCarrier.com GmbH have the right to revise and amend these terms and conditions from time to time to reflect changes in market conditions affecting PrintCarrier.com GmbH business, changes in technology, changes in payment methods, changes in relevant laws and regulatory requirements and changes in PrintCarrier.com GmbH system´s capabilities. 2.9 The Buyer will be subject to the policies and terms and conditions in force at the time that the Buyers orders Goods from PrintCarrier.com GmbH , unless any change to those policies or these terms and conditions is required to be made by law or governmental authority (in which case it will apply to orders previously placed by the Buyer), or if PrintCarrier.com GmbH notify the Buyer of the change to those policies or these terms and conditions before PrintCarrier.com GmbH send the Buyer the Dispatch Confirmation (in which case PrintCarrier.com GmbH have the right to assume that the Buyer has accepted the change to the terms and conditions, unless the Buyer notify PrintCarrier.com GmbH to the contrary within seven working days of receipt by the Buyer of the Goods). 2.10 The Contract between PrintCarrier.com GmbH and the Buyer will only be formed when PrintCarrier.com GmbH sends the Buyer an Order Confirmation. 2.11 The Buyer must provide 3 months written notice to terminate any Contract which involves any element of regular/periodic work. 2.12.1 The quantity and description of the Goods shall be as set out in PrintCarrier.com GmbH ´s Order Confirmation. PrintCarrier.com GmbH ´s Website, catalogues or brochures are displayed, issued or published for the sole purpose of giving an approximate idea of the Goods described in them. They shall not form part of the Contract and this is not a sale by sample. Website. PrintCarrier.com GmbH will not inspect the Files or any other documentation submitted by the Buyer in respect of the purchase of Goods unless the File Verification Service has been requested. 2.13.2 If the Buyer would like PrintCarrier.com GmbH to carry out checks to ensure the Files are in a Print Ready Format and comply with the Website requirements then the Buyer should tick the appropriate box on the Website or email PrintCarrier.com GmbH accordingly requesting the File Verification Service. If the Buyer chooses not to request the File Verification Service and the Files are not in a Print Ready Format then PrintCarrier.com GmbH will have no liability for any Goods which are not in accordance with the Buyers intentions for those Goods. 2.13.3 The Buyer acknowledges and agrees that Files uploaded from a system which views files through an RGB format will not produce the same colour effects or depth of colours as those of PrintCarrier.com GmbH who use a CMYK format. The Buyer therefore accepts the Goods and Services irrespective of the results which may be produced by the different formats stated above. 2.13.4 Any amendments to the Order after the Order Confirmation has been sent shall only be considered in accordance with the Website guidelines and will be subject to any additional costs in accordance with clause and as may be communicated to the Buyer by PrintCarrier.com GmbH or as displayed on the Website. 2.13.5 The Buyer must at all times monitor its User Account in relation to queries relating to the Order and general notices made by PrintCarrier.com GmbH . PrintCarrier.com GmbH are under no obligation to communicate in any other way at any point from when the Order is placed up until delivery of the Goods has been made and the Contract has been completed. 2.14.1 Unless otherwise agreed in writing or as stated in the Order Confirmation by PrintCarrier.com GmbH , delivery of the Goods shall take place at PrintCarrier.com GmbH ´s place of business. In such circumstances the Buyer shall take delivery of the Goods within 14 days of PrintCarrier.com GmbH giving it notice that the Goods are ready for delivery. 2.14.2 Any dates specified by PrintCarrier.com GmbH for delivery of the Goods are intended to be an estimate and time for delivery shall not be made of the essence by notice. If no dates or times are so specified, delivery shall be within a reasonable time. 2.14.3 Subject to the other provisions of these conditions PrintCarrier.com GmbH shall not be liable for any direct, indirect or consequential loss (all three of which terms include, without limitation, pure economic loss, loss of profits, loss of business, depletion of goodwill and similar loss), costs, damages, charges or expenses caused directly or indirectly by any delay in the delivery of the Goods (even if caused by PrintCarrier.com GmbH ´s negligence), nor shall any delay entitle the Buyer to terminate or rescind the Contract unless such delay exceeds 30 days. 2.14.4 Subject to clause where the Buyer has chosen a higher/quicker standard of delivery and PrintCarrier.com GmbH fails to comply with such higher/quicker standard, then the Buyer shall be entitled to a refund of the difference between the higher/quicker standard of delivery and the standard of delivery which actually took place. d) PrintCarrier.com GmbH may dispose of the Goods, without prejudice to any payment obligations placed upon the Buyer under this Contract. 2.14.6 The Buyer shall provide at the Delivery Point and at its expense adequate and appropriate equipment and manual labour for loading the Goods. 2.14.7 If PrintCarrier.com GmbH delivers to the Buyer a quantity of Goods of up to 10% more or less than the quantity accepted by PrintCarrier.com GmbH , the Buyer shall not be entitled to object to or reject the Goods or any of them by reason of the surplus or shortfall and shall pay for such goods at the pro rata Contract rate. Such shortages include spoilage, start-up sheets, adjustment copies for further processing machinery, production related cuttings of the upper and lower sheets, which are not removed. 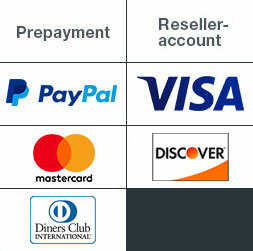 2.14.8 PrintCarrier.com GmbH may deliver the Goods by separate instalments. Each separate instalment shall be invoiced and paid for in accordance with the provisions of the Contract. 2.14.9 Each instalment shall be a separate Contract and no cancellation or termination of any one Contract relating to an instalment shall entitle the Buyer to repudiate or cancel any other Contract or instalment. 2.15.1 The quantity of any consignment of Goods as recorded by PrintCarrier.com GmbH on despatch from PrintCarrier.com GmbH ´s place of business shall be conclusive evidence of the quantity received by the Buyer on delivery unless the Buyer can provide conclusive evidence proving the contrary. 2.15.2 PrintCarrier.com GmbH shall not be liable for any non-delivery of Goods (even if caused by PrintCarrier.com GmbH ´s negligence) unless the Buyer gives written notice to PrintCarrier.com GmbH of the non-delivery within 7 days of the date on when the Goods would in the ordinary course of events have been received by the Buyer. c) refunding the Buyer for the pro rata Contract rate against any invoice raised for such Goods. 2.16.1 The Goods are at the risk of the Buyer from the time when the Goods are transferred to a carrier for delivery or if the Buyer requests a delay in delivery the risk shall transfer when the Goods are ready for delivery. b) all other sums which are or which become due to PrintCarrier.com GmbH from the Buyer on any account. 2.16.3 PrintCarrier.com GmbH shall be entitled to recover payment for the Goods notwithstanding that ownership of any of the Goods has not passed from PrintCarrier.com GmbH . 2.16.4 The Buyer grants PrintCarrier.com GmbH , its agents and employees an irrevocable licence at any time to enter any premises where the Goods are or may be stored in order to inspect them, or, where the Buyer´s right to possession has terminated, to recover them. 2.17.1 Unless otherwise agreed by PrintCarrier.com GmbH in writing, the price for the Goods and/or Services shall be the price set out in PrintCarrier.com GmbH ´s Website as at the date of Order Confirmation except in cases of obvious error. 2.17.2 The Order Confirmation and/or Website will set out whether the price for the Goods includes or excludes any value added tax and all costs or charges in relation to packaging, loading, unloading, carriage and insurance. 2.17.3 Prices are liable to change at any time, but changes will not affect Orders in respect of which PrintCarrier.com GmbH have already sent an Order Confirmation to the Buyer. 2.17.4 The Website contains a large number of Goods and it is always possible that, despite PrintCarrier.com GmbH best efforts, some of the Goods listed on the Website may be incorrectly priced. In the case of error PrintCarrier.com GmbH are under no obligation to provide the Goods to the Buyer at the incorrect (lower) price, even after PrintCarrier.com GmbH have sent an Order Confirmation, if the pricing error is obvious and unmistakeable and could have reasonably been recognised by the Buyer as a mis-pricing. 2.17.5 Payment in respect of an Order is due immediately once the Buyer has received the Order Confirmation and/or where communicated through the User Account within 48 hours of such message/notice being placed on the User Account. PrintCarrier.com GmbH will not commence the works until payment of the price set out in the Order Confirmation has been paid in full. 2.17.6 Payment for all Goods can be by bank transfer, credit or debit card or third party payment system provider such as Paypal, Worldpay, Protyx subject to these terms and conditions. 2.17.8 PrintCarrier.com GmbH may request payment upfront if it deems appropriate in the circumstances to do so. This may be linked to the credit worthiness of the Buyer. 2.17.9 Where payment is made through a third party service provider and a dispute occurs between the Buyer and PrintCarrier.com GmbH which leads to a refund being made by the third party service provider to the Buyer, the Buyer should note that PrintCarrier.com GmbH reserves the right to pursue the Buyer through the courts (where appropriate and if necessary) for payment of the sums refunded by the third party service provider. 2.17.10 PrintCarrier.com GmbH will not process an Order until payment has been received. 2.17.11 The Buyer shall make all payments due under the Contract in full without any deduction whether by way of set-off, counterclaim, discount, abatement or otherwise unless the Buyer has a valid court order requiring an amount equal to such deduction to be paid by PrintCarrier.com GmbH to the Buyer. 2.17.12 If the Buyer fails to pay PrintCarrier.com GmbH any sum due pursuant to the Contract, the Buyer shall be liable to pay interest to PrintCarrier.com GmbH on such sum from the due date for payment at the annual rate of 4% above the base lending rate from time to time of Natwest Bank Plc accruing on a daily basis until payment is made, whether before or after any judgment. PrintCarrier.com GmbH also reserves the right to claim interest under the Late Payment of Commercial Debts (Interest) Act 1998.
c) before or after the Order Confirmation PrintCarrier.com GmbH standard charge rates in respect of any services or other additional work required as a result of any amendments made by the Buyer. PrintCarrier.com GmbH will endeavour to advise the Buyer of such a charge before proceeding with the amendments. 2.17.14 Charges for attempting re-delivery of Goods shall be the standard delivery charges of Goods subject to any additional costs which may be incurred as a result of PrintCarrier.com GmbH in attempting re-delivery. the price of the Goods, which will be due in accordance with these terms and conditions. 2.17.16 PrintCarrier.com GmbH will only consider a cancellation of an Order, prior to an Order Confirmation has been sent subject to payment of an Order Cancellation Fee. 2.17.17 Cancellations to Orders by the Buyer whether before or after the Order Confirmation has been sent will not affect any fees due to PrintCarrier.com GmbH in respect of any Goods and Services which PrintCarrier.com GmbH has agreed to provide. 2.17.18 Refunds will only be processed in accordance with these terms and conditions and any requirements as may be set out on the Website. b) PrintCarrier.com GmbH is given a reasonable opportunity to examine such Goods in accordance with time limit specified in clause . d) the defects relate to slight deviations in colour reproductions or other such minor and non material issues to the Goods. 2.18.4 Subject to condition and condition , if any of the Goods do not conform with warranties in condition PrintCarrier.com GmbH shall at its option replace such Goods (or the defective part) or refund the price of such Goods at the pro rata Contract rate provided that, if PrintCarrier.com GmbH so requests, the Buyer shall, return the Goods or the part of such Goods which is defective to PrintCarrier.com GmbH . PrintCarrier.com GmbH shall have no further liability. 2.18.5 If PrintCarrier.com GmbH complies with condition it shall have no further liability for a breach of any of the warranties in condition in respect of such Goods. 2.19.2 All warranties, conditions and other terms implied by statute or common law (save for the conditions implied by section 12 of the Sale of Goods Act 1979) are, to the fullest extent permitted by law, excluded from the Contract. c) afor fraud or fraudulent misrepresentation. b) PrintCarrier.com GmbH shall not be liable to the Buyer for loss of profit, loss of business, or depletion of goodwill in each case whether direct, indirect or consequential, or any claims for consequential compensation whatsoever (howsoever caused) which arise out of or in connection with the Contract. c) PrintCarrier.com GmbH may also provide links on the Website to the websites of other companies, whether affiliated with PrintCarrier.com GmbH or not. PrintCarrier.com GmbH cannot give any undertaking, that goods, services, the Buyer purchase from third party sellers through the Website, or from companies to whose website PrintCarrier.com GmbH have provided a link on the Website, will be of satisfactory quality, and any such warranties are DISCLAIMED by PrintCarrier.com GmbH absolutely. This DISCLAIMER does not affect the Buyer statutory rights against the third party seller. PrintCarrier.com GmbH will notify the Buyer when a third party is involved in a transaction, and PrintCarrier.com GmbH may disclose the Buyer’s customer information related to that transaction to the third party seller. 2.20.1 Unless the Buyer states in writing otherwise, the Buyer hereby authorises PrintCarrier.com GmbH to use and send out copy samples of the Buyers Goods to third parties for marketing and promotional purposes. 2.20.2 The Buyer undertakes to defend PrintCarrier.com GmbH from and against any claim or action that the use or possession of any of the Files or Goods or any part of them infringes the intellectual property rights of a third party (IPR Claim) and shall fully indemnify and hold harmless PrintCarrier.com GmbH from and against any losses, damages, costs (including legal fees) and expenses incurred by or awarded against PrintCarrier.com GmbH as a result of or in connection with that IPR Claim. The indemnity contained in clause shall remain in full force and effect notwithstanding any termination of this agreement. 2.20.3 Where PrintCarrier.com GmbH has provided creative services on behalf of the Buyer included but not limited to graphic designs, pictures, artwork, text marks, layouts the Buyer acknowledges and agrees that PrintCarrier.com GmbH shall be the owner of such intellectual property and shall be under no obligation to provide Goods with the same graphic designs, pictures, artwork, text marks in any future Orders. PrintCarrier.com GmbH will consider any reasonable offer made by the Buyer to purchase such intellectual property from PrintCarrier.com GmbH . If the Buyer receives the Goods and is not satisfied with the Goods and wishes to make a complaint to PrintCarrier.com GmbH , PrintCarrier.com GmbH must receive the requested number of samples and other documentation (as set out in the complaints procedures on the Website) within 14 days of the Buyer receiving the Goods otherwise complaints will not be processed by PrintCarrier.com GmbH . 3.1 If the Buyer orders Goods from the Website for delivery outside the UK, the Buyer may be subject to import duties and taxes which are levied when the delivery reaches the specified destination. The Buyer will be responsible for payment of any such import duties and taxes. Please note that PrintCarrier.com GmbH have no control over these charges and cannot predict their amount. The Buyer should contact the Buyer’s local customs office for further information before placing an order for the purchase of Goods. The Buyer should also check to see whether PrintCarrier.com GmbH offer the same service in such a country before proceeding with an order in the UK. 3.2 The Buyer must also comply with all applicable laws and regulations of the country for which the Goods are destined. PrintCarrier.com GmbH will not be liable for any breach by the Buyer of any such laws. 3.3.1 PrintCarrier.com GmbH may assign the Contract or any part of it to any person, firm or company. 3.3.2 The Buyer shall not be entitled to assign the Contract or any part of it without the prior written consent of PrintCarrier.com GmbH . 3.6.1 PrintCarrier.com GmbH will not be liable or responsible for any failure to perform, or delay in performance of, any of PrintCarrier.com GmbH obligations under a Contract that is caused by events outside PrintCarrier.com GmbH reasonable control (Force Majeure Event). c) Fire, explosion, storm, flood, earthquake, bad weather subsidence, pandemic, epidemic or other natural disaster. 3.3.3 Our performance under any Contract is deemed to be suspended for the period that the Force Majeure Event continues, and PrintCarrier.com GmbH will have an extension of time for performance for the duration of that period. PrintCarrier.com GmbH will use its reasonable endeavours to bring the Force Majeure Event to a close or to find a solution by which PrintCarrier.com GmbH obligations under the Contract may be performed despite the Force Majeure Event. Applicable laws require that some of the information or communications PrintCarrier.com GmbH send to the Buyer should be in writing. When using the Website, the Buyer accepts that communication with PrintCarrier.com GmbH will be mainly electronic and in particular the Buyer will need to monitor the User Account on a regular basis until the Contract has been completed. PrintCarrier.com GmbH will contact the Buyer by the User Account or e-mail to provide the Buyer with information. For contractual purposes, the Buyer agrees to this electronic means of communication and acknowledges that all contracts, notices, information and other communications that PrintCarrier.com GmbH provide to the Buyer electronically comply with any legal requirement that such communications be in writing. This condition does not affect the Buyers statutory rights. 4.1 Each right or remedy of PrintCarrier.com GmbH under the Contract is without prejudice to any other right or remedy of PrintCarrier.com GmbH whether under the Contract or not. 4.2 If any provision of the Contract is found by any court, tribunal or administrative body of competent jurisdiction to be wholly or partly illegal, invalid, void, voidable, unenforceable or unreasonable it shall to the extent of such illegality, invalidity, voidness, voidability, unenforceability or unreasonableness be deemed severable and the remaining provisions of the Contract and the remainder of such provision shall continue in full force and effect. 4.3 Failure or delay by PrintCarrier.com GmbH in enforcing or partially enforcing any provision of the Contract shall not be construed as a waiver of any of its rights under the Contract. 4.4 Any waiver by PrintCarrier.com GmbH of any breach of, or any default under, any provision of the Contract by the Buyer shall not be deemed a waiver of any subsequent breach or default and shall in no way affect the other terms of the Contract. 4.5 The parties to the Contract do not intend that any term of the Contract shall be enforceable by virtue of the Contracts (Rights of Third Parties) Act 1999 by any person that is not a party to it. 4.6 This Contract and any dispute or claim arising out of or in connection with it or its subject matter or formation (including non-contractual disputes or claims) shall be governed by and construed in accordance with English law, and the parties submit to the exclusive jurisdiction of the English courts.